The J-Fest: Learning about Kyrgyz Traditions in One Day! I timed my visit to Jyrgalan to coincide with their second annual Summer Festival. 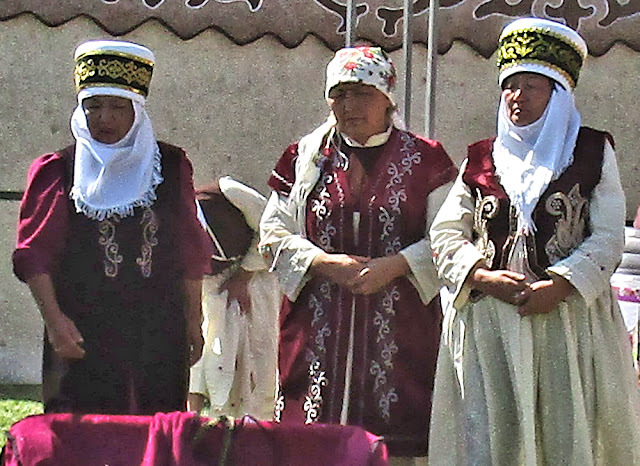 It is mainly held for the villagers to have an opportunity to share their customs and traditions with visitors. There is lots of music and dance demonstrations. In a strong alto voice, this young woman recited a small part of the traditional Manas epic. A group of grandmothers showed the traditional way to lay a baby in its cradle for the first time with singing and ritual. 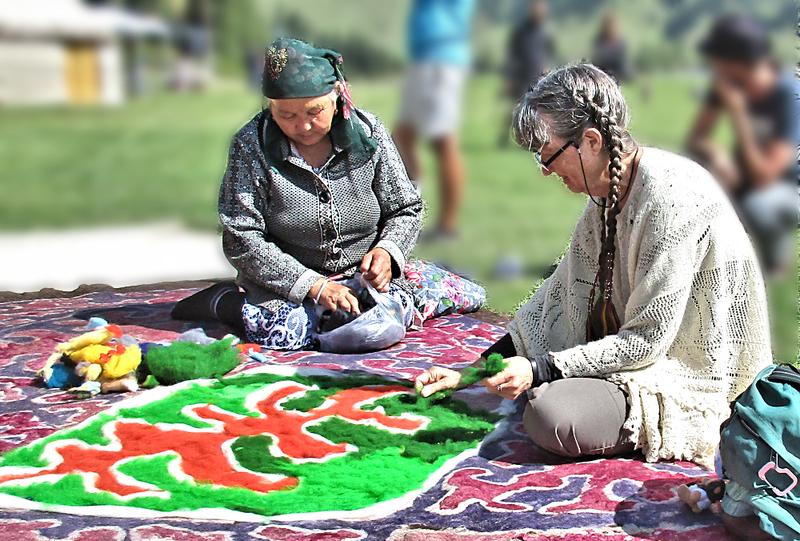 There were also demonstrations of how ala-kiyiz felted carpets are made, opportunities to taste kumiz, (fermented mare’s milk), and a lunch of beshbarmak with plenty of tea available! I was honored to be invited to help lay down some wool fiber on the ala-kiyiz carpet. 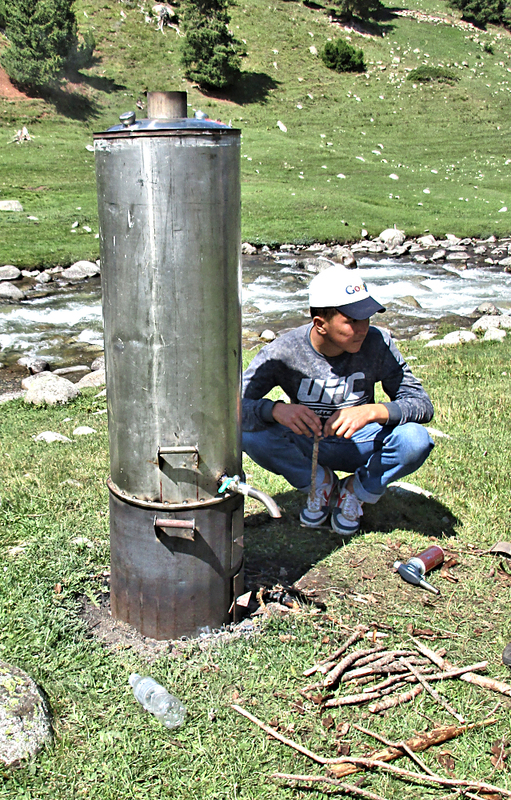 Down by the river, a couple young man tended this giant samovar so there would be plenty of tea for lunch. 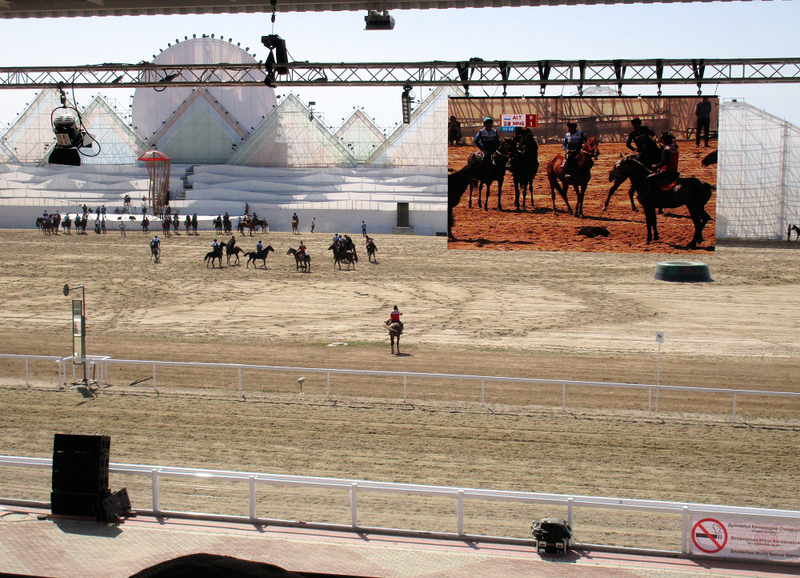 I enjoyed wandering around watching the horsemen warm up for the afternoon activities. 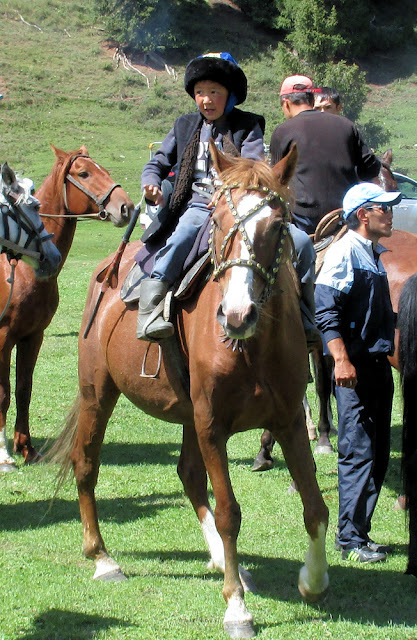 They are so comfortable on horseback that it is almost like they are one with the horse—even the very young children. 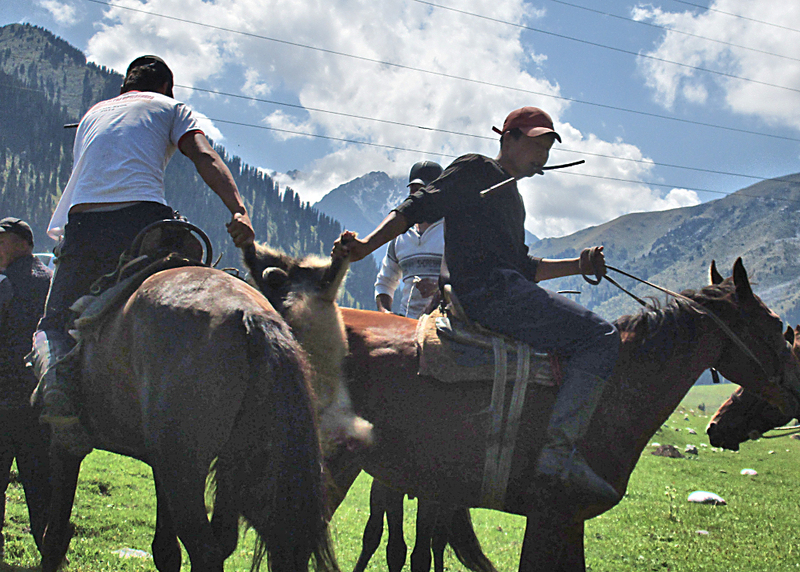 These men are tugging at a goat carcass…more about that later. Who will end up with the goat? later in the day. But I doubt it will be long before he does. Lunch was included in our ticket and we lined up to get salad and plates of besbarmak. I sat down to eat next to the roaring river. 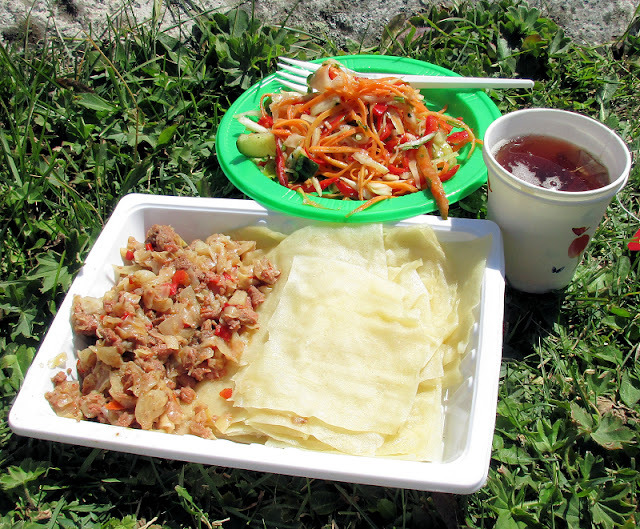 The name of the dish means “five fingers.” You certainly use five fingers to eat it because you pick up one of the square noodles and scoop up some of the meat into it and quickly stuff it in your mouth. Usually besbarmak is served as a communal dish and everyone eats from one large dish. I particularly love the thin noodles. The noodles are steamed, not boiled. And these women cooked quite a few in this giant steamer over an open fire. In the afternoon, we got a close-up look at er-enish (horse wrestling). 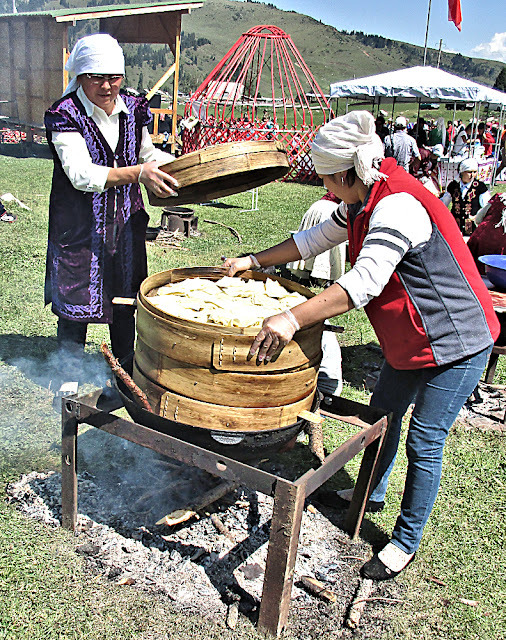 The grand finale for the festival was a lively game of kok boru—which is similar to polo, but a heavy, headless goat carcass is used instead of a ball and there are no mallets. The goat must be lifted from the ground by the players and carried to the goal. In this game, a small goat was used, but it must have weighed 20 pounds or more. It certainly requires some excellent horsemanship to be able to pick it up off the ground, tuck it under your leg, and race down the field with four other horsemen trying to get it away from you. The circles that represent the goals were probably 10 meters across, but it was very difficult for the players to time the dropping of the goat so it landed inside the circle. More often than not, either the carrier shot past the goal to make another attempt, or the forward momentum carried the dropped carcass beyond the goal. It was quite an experience to be sitting at the edge of the field. Several times we had to jump up to get out of the way of the players and horses coming right for us. A couple weeks later I attended one game of the kok boru championships at the 2018 World Nomad Games, but it was not nearly as interesting and exciting as the small event at Jyrgalan. In the Nomad Games stadium, we were so far away from the field, that I could only tell what was happening by watching the giant screens in front of the audience. I did not have to jump out of the path of a horse one time—I might as well have been watching it at home on television. However, if you are interested, you can see some shots from the Kok-Boru finals in the 2018 World Nomad Games here. You will see that the goat is quite a bit larger and the players more ruthless at this level of the game. The day ended with dancing for all. The kids sure do like the Macarena!